Enjoying yourself at the range or while plinking in your backyard isn’t something you should have to shell out big bucks for. Sure, premium ammunition with solid palladium projectiles and casings carved out of meteorites are fun if you’ve got them, but there will always be a place for the stuff that’s a little friendlier on the budget. 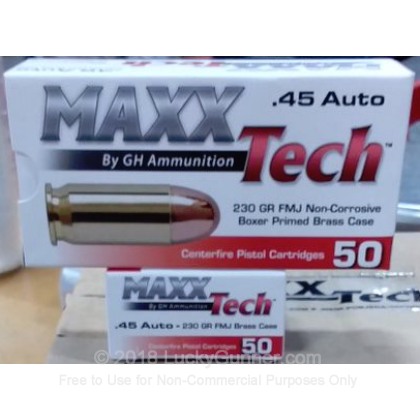 This 45 ACP round by MAXX Tech is exactly that. This round’s 230 grain projectile is a common weight for its caliber, and one you’ll certainly be familiar with if you’ve ever hoisted a 1911. The bullet wears a full metal jacket to ensure that it functions positively in a semi-automatic, and also that it doesn’t quickly leave behind a thin film of residue in your bore that would harm your accuracy. Unlike much cost-effective ammo from the part of the world where MAXX Tech is headquartered, this round’s new casing is made of brass and is fitted with a non-corrosive Boxer primer.